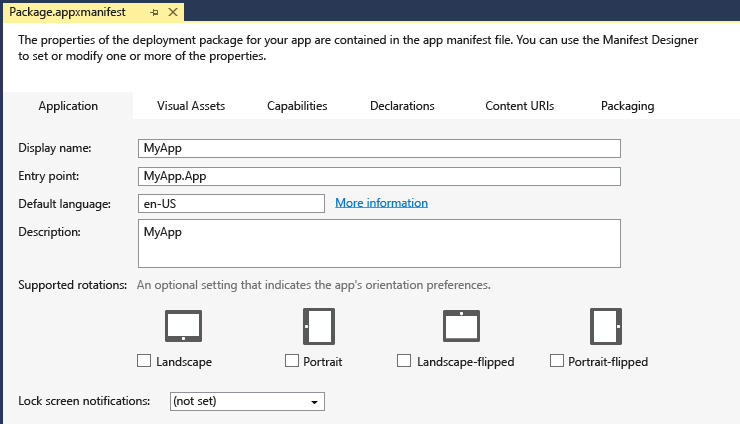 To sell your Universal Windows app or distribute it to other users, you need to create an appxupload package for it. When you create the appxupload, another appx package will be generated to use for testing and sideloading. You can distribute your app directly by sideloading the appx package to a device. (What is sideloading?). For Windows 10, you generate one package (.appxupload) that can be uploaded to the Windows Store. Your app is then available to be installed and run on any Windows 10 device. Before packaging your app: Follow these steps to make sure your application is ready to be packaged for store submission. 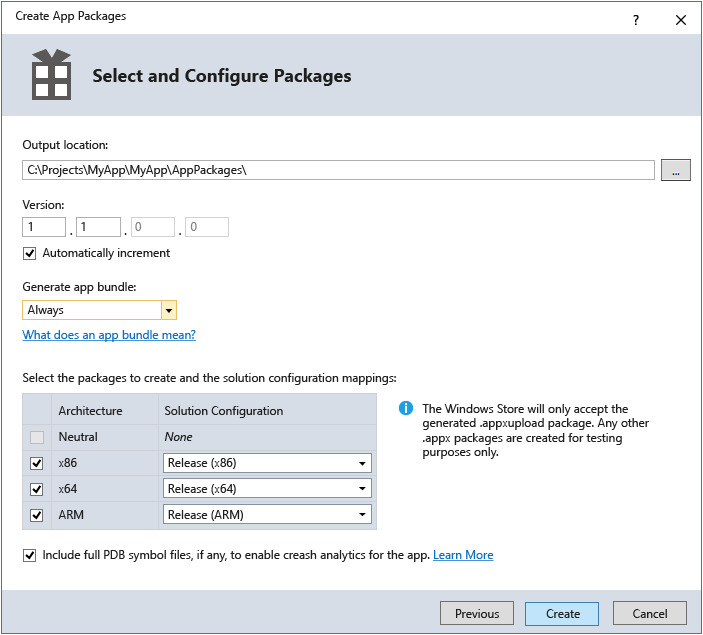 Configure an app package: Use the manifest designer to configure the package. For example, add tile images and choose the orientations that your app supports. 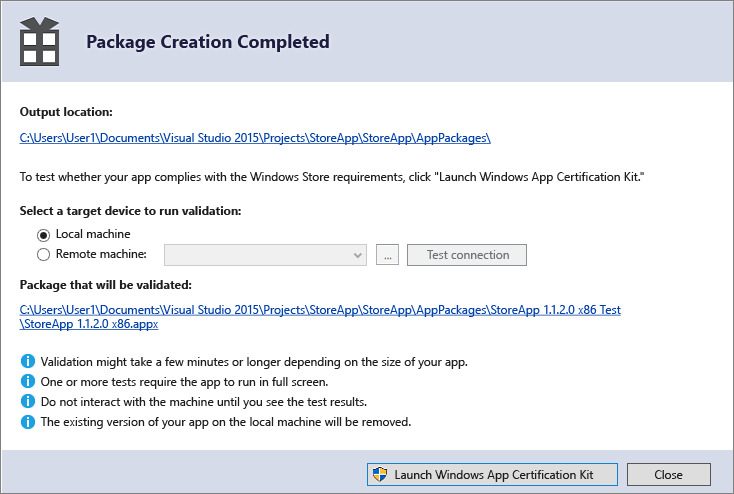 Create an app package: Use the wizard in Visual Studio and then certify your package with the Windows App Certification Kit. Sideload your app package: After sideloading your app to a device, you can test it works correctly. Once you’ve done this, you are ready to sell your app in the Store. If you have a line-of-business (LOB) app, that you don’t plan to sell because it is for internal users only, you can sideload this app to install it on any Windows 10 device. Test your app: Before you package your app for store submission, make sure it works as expected on all device families that you plan to support. These device families may include desktop, mobile, Surface Hub, XBOX, IoT devices, or others. Optimize your app: You can use Visual Studio’s profiling and debugging tools to optimize the performance of your Universal Windows app. For example, the Timeline tool for UI responsiveness, the memory Usage tool, the CPU Usage tool, and more. Learn about them here. Check .NET Native compatibility (for VB and C# apps): With the Universal Windows Platform, there is now a new native compiler that will improve the runtime performance of your app. With this change, it is highly recommended that you test your app in this compilation environment. By default, the Release build configuration enables the .NET native toolchain, so it is important to test your app with this Release configuration and check that your app behaves as expected. Some common debugging issues that can happen with .NET Native are explained in more detail here. The app manifest file (package.appxmanifest.xml) has the properties and settings that are required to create your app package. For example, properties in the manifest file describe the image to use as the tile of your app and the orientations that your app supports when a user rotates the device. Visual Studio has a manifest designer that makes it easy for you to update the manifest file without editing the raw XML of the file. Visual Studio can associate your package with the Store. When you do this, some of the fields in the Packaging tab of the manifest designer are automatically updated. How do I associate my package with the store? 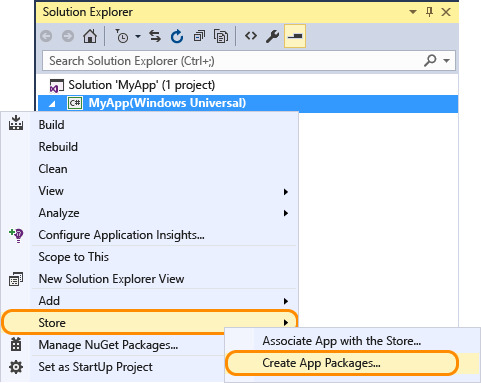 In Solution Explorer, expand the project node of your Universal Windows app. Now you can decide how to configure your app. Each tab contains information that you can configure about your app and links to more information if necessary. Check that you have all the images that are required for a Universal Windows app on the Visual Assets tab. How do I create images to handle all the different screen resolutions for Windows 10 devices? From the Packaging tab, you can enter publishing data. This is where you can choose which certificate to use to sign your app. All Universal Windows Apps must be signed with a certificate. In order to sideload an app package, you need to trust the package. The certificate must be installed on that device to trust the package. Learn more about sideloading onto Windows 10 devices. Save your file after you have made the necessary edits for your app. In Solution Explorer, open the solution for your Universal Windows app project. Right-click the project and choose Store->Create App Packages. If this option is disabled or does not appear at all, check that the project is a Universal Windows project. Select Yes in the first dialog asking if you want to build packages to upload to the Windows Store, then click Next. If you choose No here, Visual Studio will not generate the required .appxupload package you need for store submission. If you only want to sideload your app to run it on internal devices, then you can select this option. Learn how to set up your devices for sideloading with Windows 10. Select the app name for your package, or reserve a new one if you have not already reserved one with the Windows Dev Center portal. Make sure you select all three architecture configurations (x86, x64, and ARM) in the Select and Configure Packages dialog. That way your app can be deployed to the widest range of devices. In the Generate app bundle listbox, select Always. This makes the store submission process much simpler because you will only have one file to upload (.appxupload). The single bundle will contain all the necessary packages to deploy to devices with each processor architecture. It is a good idea to include full PDB symbol files for the best crash analytics experience from the Windows Dev Center. You can learn more about debugging with symbols here. Now you can configure the details to create your package. When you’re ready to publish your app, you’ll upload the packages from the output location. Click Create to generate your appxupload package. To validate locally, leave the Local machine option selected and click Launch Windows App Certification Kit. Learn how to test your app with the Windows App Certification Kit. If you have a remote Windows 10 device, that you want to use for testing, you will need to install the Windows App Certification Kit manually on that device. The next section will walk you through these steps. Once you’ve done that, then you can select Remote machine and click Launch Windows App Certification Kit to connect to the remote device and run the validation tests. After WACK has finished and your app has passed, you are ready to upload to the store. Make sure you upload the correct file. It can be found in the root folder of your solution \[AppName]\AppPackages and it will end with .appxupload file extension. The name will be of the form [AppName]_[AppVersion]_x86_x64_arm_bundle.appxupload. Enable your Windows 10 device for development using these instructions. You cannot validate your app package on a remote ARM device for Windows 10. Download and install the remote tools for Visual Studio. These tools are used to run the Windows App Certification Kit remotely. Start the remote debug monitor as described here. Download the required version of the Windows App Certification Kit and then install it on your remote Windows 10 device. On the Package Creation Completed page of the wizard, choose the Remote Machine option button, and then choose the ellipsis button next to the Test Connection button. The Remote Machine option button is available only if you selected at least one solution configuration that supports validation. Learn how to test your app with the Windows App Certification Kit. With Universal Windows app packages, you cannot simply install an app to your device like Desktop apps for example. Typically, you download these apps from the Store and that is how they are installed on your device. But you can sideload apps to your device without submitting them to the Store. This lets you install them and test them out using the app package (.appx) that you have created. If you have an app that you don’t want to sell in the Store, like a line-of-business (LOB) app, you can sideload that app so that other users in your company can use it. To install your app to a desktop, laptop, or tablet, follow the steps in the section below. To install an app to a Windows 10 Mobile device, use the WinAppDeployCmd.exe. After you have sideloaded your app to test it, you can upload your package to sell your app in the Store, or you can sideload your app to any Windows 10 device. Learn about ways to sideload a line-of-business (LOB) app to other users in your company. Copy the folders for the version that you want to install to the target device. On the target device, open the test folder. For example: C:\Projects\MyApp\MyApp\AppPackages\MyApp_1.0.2.0_Test. Right-click the Add-AppDevPackage.ps1 file, then choose Run with PowerShell and follow the prompts. When the app package has been installed, you will see this message in your PowerShell window: Your app was successfully installed. To open the shortcut menu on a tablet, touch the screen where you want to right-click, hold until a complete circle appears, and then lift your finger. The shortcut menu appears after you lift your finger. Click the Start button and then type the name of your app to launch it. Q: How do I create a developer account from Visual Studio? A: From the Project menu, choose Store -> Open Developer Account. This opens the Dev Center for Store apps. From there, you can create a develop account, which you’ll need to upload apps to the Store. Learn more about the App Developer Agreement. Q: How do I reserve a name for my app? How long is it reserved for? A: From the Project menu, choose Store -> Reserve App Name. Sign in to the Store. After your credentials are checked, you can reserve a name for your app. When the Store is open for app submissions, you can reserve an app name for one year. If you don’t submit an app within the next year, the reservation expires, and another developer could reserve the name. Learn more about naming and describing your app. Q: Can I associate my app with the Store? If you override the default package.appxmanifest file by creating a custom .xml file for the manifest, you can’t associate your app with the Store. If you try to associate a custom manifest file with the Store, you will see an error message. Q: How do I take screenshots of my app to use when I submit it to the Store? A: From the Project menu, choose Store -> Capture Screenshots. This builds the current project and launches the app in the simulator. When the simulator opens, choose the Copy screenshot button on the simulator side bar. Q: How do I upload my app package to the Store? A: From the Project menu, choose Store -> Upload App Packages. Sign in to the Store. After your credentials are checked, the Dashboard opens. If you reserved a name for your app, you will use this tool to edit the existing release. If you didn’t reserve the name, choose Submit a new app, and then follow the instructions on the screen. Q: How do I install a certificate and my app package separately? A: Open the folder that contains the PowerShell script to install your app package. For example, C:\Projects\MyApp\MyApp\AppPackages\MyApp_1.0.6.0_Test. Double-click the certificate file in the folder, and then click Install Certificate. This displays the Certificate Import Wizard. In the Store Location group, tap the radio button to change the selected option to Local Machine. Tap OK to confirm the UAC dialog. In the next screen of the Certificate Import Wizard, change the selected option to Place all certificates in the following store. Tap the Browse button. In the Select Certificate Store pop-up window, scroll down and select Trusted People, and then tap OK. Tap the Next button; a new screen appears. Tap the Finish button. Use the add-appxpackage cmdlet for PowerShell add-appxpackage cmdlet details. Q: Why use an app bundle? A: Users can download faster with an app bundle because they only download the assets that they need. If your app contains language-specific resources, a variety of image scales, or resources that apply to specific versions of DirectX, you should generate an app bundle. If you don't generate one, your app will run just fine, but your users will have to download a larger app. Learn more about app bundles. One app bundle can contain the packages for all architectures, so you only need one bundle per app. If you create an app bundle, you can submit your app to the Store more easily. You only have to upload one .appx file - no matter how many architectures your app supports. For example, only one upload to support x86 and x64. If you don't create an app bundle, you must upload an .appx file for all supported architectures. Q: How do I create images to handle all the different screen resolutions for Windows 10 devices? A: You can add different versions of each image that identify your app using the package manifest designer - image assets in your app, logos and splash screen images. Then, you can test them to ensure that they look good on a variety of devices that have different screen resolutions. Learn how to manage and organize file and image resources for these and other images. When thinking about different screen resolutions for your Windows 10 devices, it’s also important to create a responsive design for Universal Windows apps. Q: How can I localize the description of my app for users? A: You can make your app more attractive to international audiences by localizing its display name, description, and other identifying features, which are described in the package manifest file. Learn how to load resource files based on the language. Go to the Loading strings from the app manifest section in that topic. You can also localize your app itself by using resource files. Q: Can I create an app package from the command prompt? A: Yes. You can run MSBuild from a Visual Studio command prompt, or use Team Foundation Build. Q: How can I setup which resources are installed on a device? A: Use the Resource Management System that has a tool to help you create Package Resource Index (PRI) files with the MakePRI tool. Each PRI file contains a named collection of resources, referred to as a resource map. Q: The PowerShell script for the app package doesn’t run. Why? A: If the PowerShell script doesn’t run and there is no error message, the user access control (UAC) on the machine might have been changed. The default UAC setting is Notify me only when apps try to make changes to my computer (default), but it can be changed to Never notify me. If you use a standard user account to log on to a machine whose UAC is set to Never notify me, any changes that require administrator permissions are automatically denied. Under these circumstances, the PowerShell script starts but requires administrative permissions to continue. The UAC dialog box doesn't appear, and Windows automatically prevents the script from making changes. To resolve this issue, either change the UAC setting or run the script as an administrator.